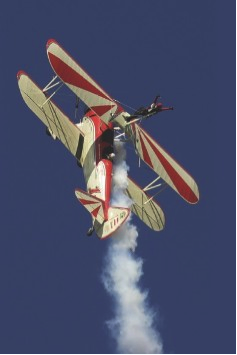 For three days during Easter, Lake Wanaka will become centre-stage for an extravaganza of aerial action that will delight aviation buffs, families and those wanting a superb day’s entertainment. At Warbirds Over Wanaka you’re so close to the continuous action that you feel like you’re in the pilot’s seat. So buckle up and hang on! Lake Wanaka is located right in the heart of the Southern Lakes and is the gateway to the Mt. Aspiring National Park. Internationally renowned for its glaciers and magnificent tramping and climbing, it is nestled on the shores of an azure blue lake amongst mighty peaks. This natural amphitheatre provides a backdrop of stunning scenery for the Warbirds Over Wanaka Airshow. This alpine resort features over 30 restaurants and has all the amenities to satisfy the most discerning visitor. It all started in 1988 when aviation entrepreneur Tim Wallis presented an airshow and country fair that attracted 14,000 visitors to Wanaka Airport on one day. As the airshow grew so did its support, and now 80,000+ people make the pilgrimage to Wanaka for their weekend of high excitement. The airshow is now a biennial centre-piece of Central Otago’s tourist attractions and one of the world’s premier Warbirds Airshows. The last show, held in 2008, saw a superb line up of aircraft, aerobatics and Royal New Zealand and Australian Airforce displays, mingled with the stars of the airshow, the Warbirds, who yet again provided the crowd with hours of aeronautical thrills. This year’s event will attract over 60 aircraft offering exhilaration and entertainment which are paramount to the show. You’ll see some of the most famous warbirds that helped defend freedom during four world conflicts. The flimsy biplanes of World War I, the heroes of World War II, the fighters of Korea and the awesome jets of Vietnam are all flown in exciting scenarios that recreate history right before your eyes. Participation by aircraft of the Royal New Zealand Air Force completes the scene. Feel the heat from huge fireballs and the concussion of explosions as a pyrotechnics display to rival the best action movie combines with military vehicles and an array of actors. As a bonus there’s a military vehicle and vintage machinery display. As you amble through acres of displays you will be able to chat with the enthusiasts who have restored and maintain these working examples, and learn how equipment has developed through the last century. The military enclosure is an area not to be missed. Vehicles from two World Wars are presented in life-like situations, complete with an array of actors in realistic uniforms. Watch the Sergeant Major bellow orders to his troops as the cook prepares lunch from the food kitchen. Tanks and half-tracks patrol the perimeter guarding against enemy attack. All of a sudden you are transported back to a world at war. The Airshow commences on Good Friday with ‘Trade Stands’ open to the public. From plastic kits to full-size aircraft, over 60 trade sites will tempt you with a full range of products. Now acclaimed as the largest Warbird Airshow in the Southern Hemisphere, this is the one event not to be missed.